Kumharas is a special place, if you’re after a relaxed, chilled place to watch the sunset with a cocktail in your hand; this is the place for you. But there is more to Kumharas than just the sunset/There are many strings to the Kumharas bow. 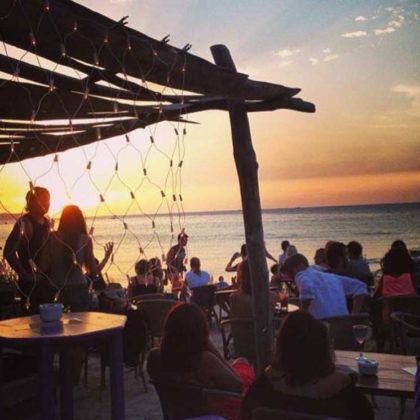 In the restaurant, the menu is inspired by Asia, they have a small hippy market with a few stalls dotted around the venue, the ‘sunset’ bar area, the only place to be to watch the sunset and all to the background of cool Balearic beats from the DJ or live musicians. 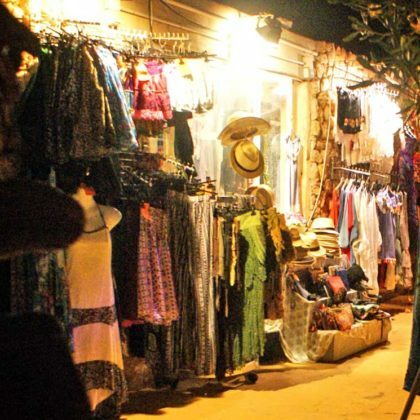 Kumharas is something of a sunset mecca. 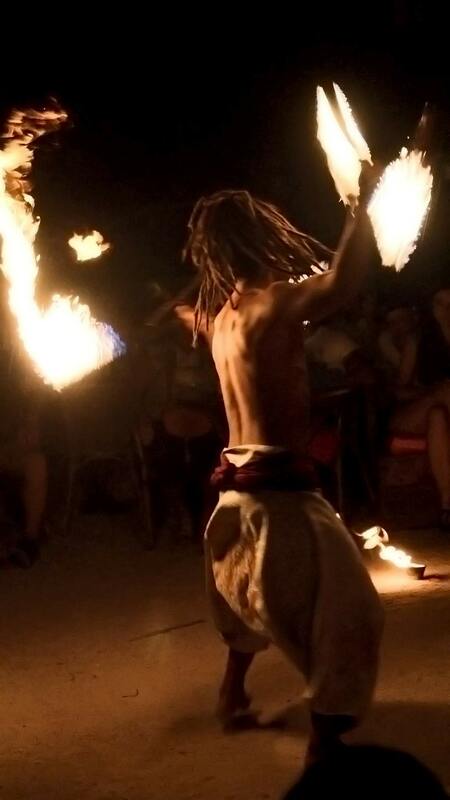 For those who don’t yet know this oasis of bay-cool we offer our sympathy and a couple of top-tips—tips so hot the Kumharas fire dancers could put on a display with them. If you want a prime sunset spot in high season, to be guaranteed a prime spot, you’ll need to be looking at least two hours before sunset. 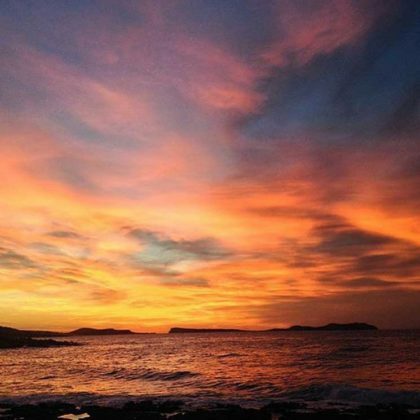 You can find out sunset for Ibiza here. But you know what, Kumharas isn’t really the sort of place you should be getting hung up about prime spots. If it is important to you, do it, but I’d just take my chances and make it a pleasure rather than an itinerary. Whatever you timescale, do not attempt to park there. Theoretically you can park adjacent, but it is carnage every night and with new parking restrictions coming into force it will only get worse. The front line seats are for drinks, the restaurant is at the rear. So do not book a meal for sunset hour if you want to see it. Most people eat before or after sunset. Finally, the waiters will be busy. Very busy. 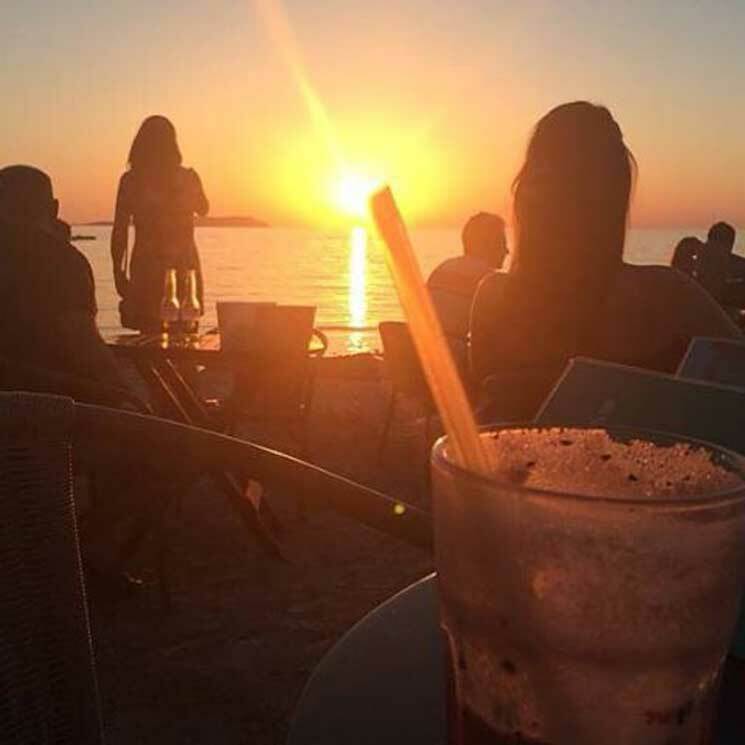 You may be sitting there, getting stressed as many of us British do, thinking you have been ignored, but most people are drinking cocktails and it takes as long as it takes. Hopefully they will acknowledge you and then you can relax knowing your turn will come—but if you want something fast and wet—go get it from the bar. Then relax. So now you know the ropes, onto the good things. 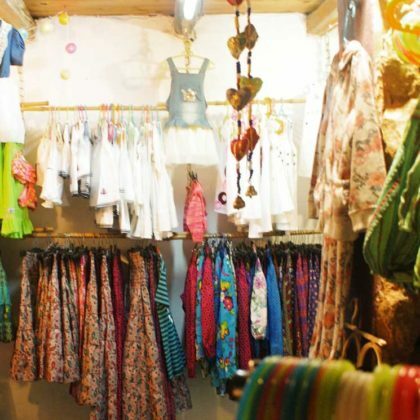 The restaurant is spacious and feels uncrowded with plenty of space between tables. 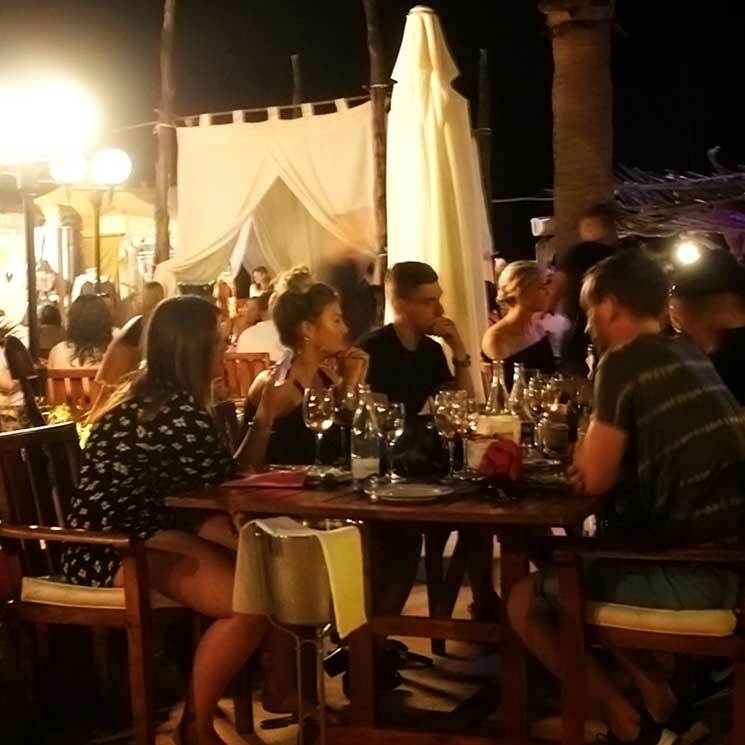 The staff again were very attentive and we had menus immediately and drinks orders taken. 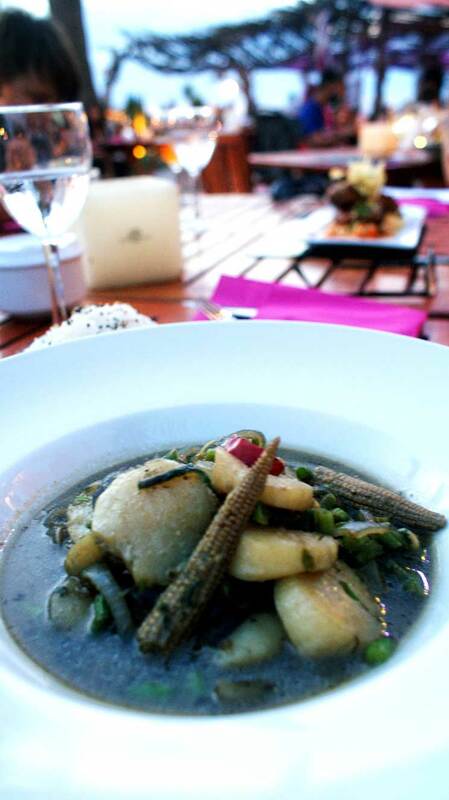 The menu is truly Asian inspired with dishes such as Thai King Prawn Salad, Thai Red/Green Curries and Ox Fillet Steak with a cold Japanese Black Pepper Sauce. We chose to share a starter . The Timbal tower that arrived was vibrant and full of colour/promise. There were chunks of crab, creamy guacamole, mango pieces and topped with red lumpfish caviar. As you delved into the Timbal more flavours came alive and the chilli powder dusted on the side gave the dish a real kick. Probably the least photographic dish served to our table, but the biggest punch of flavour. The scallops were melt in the mouth tender and their flavour was not lost in the medley of string beans, baby corn and chilli. The octopus was soft and tender, cooked exactly how it should be and the potatoes a cross between mashed and crushed (not very technical but accurate). The tandoori smokiness balanced with the creaminess of the potatoes. 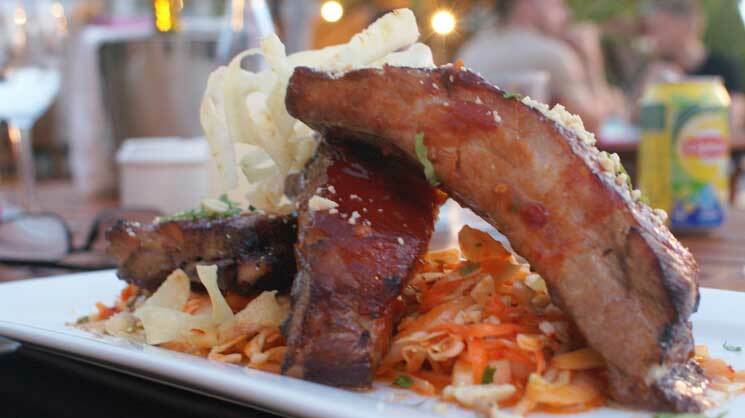 The first thing you cannot miss is the portion size, sticky succulent ribs stacked on a bed of spicy coleslaw. The meat simply fell off the bone and you could see the difference the low temperature cooking method had made. The ribs were juicy and the sambal on the coleslaw was just enough to give the dish some heat. 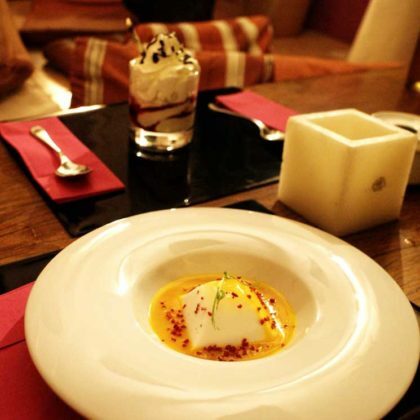 The coconut panna cotta was smooth and not too sweet, but with the mango and passionfruit sauce it was taken to another level. A deliciously light and refreshing end to the meal. We planned to share the desserts and our waiter actually said they recommend this one to share, because it is enormous. A mountain of whipped cream with chocolate sauce covered the most delicate and light white chocolate mousse, beyond which the raspberry coulis gave an acidic kick which complimented the dessert perfectly. Even the surprise of little biscuit pieces added texture to the dish. 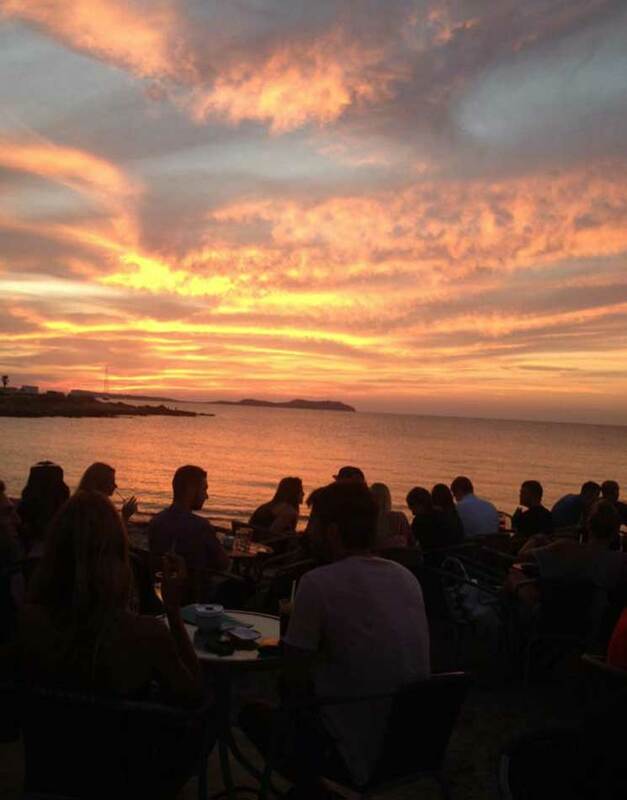 Throughout dinner, and then watching the sun set in front of us, we were treated to Balearic beats from DJ José Rives. 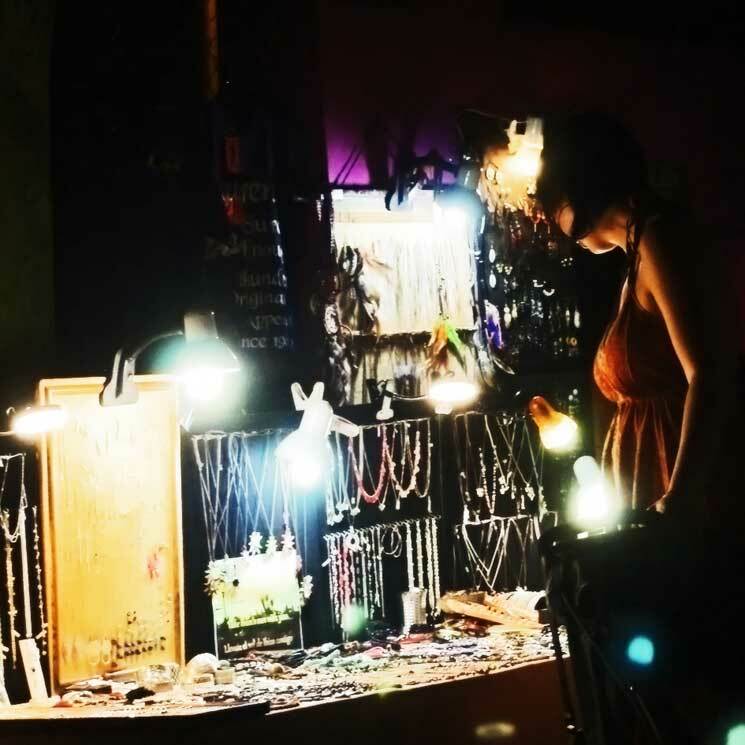 Calm, almost soothing sounds that didn’t burst your eardrums. 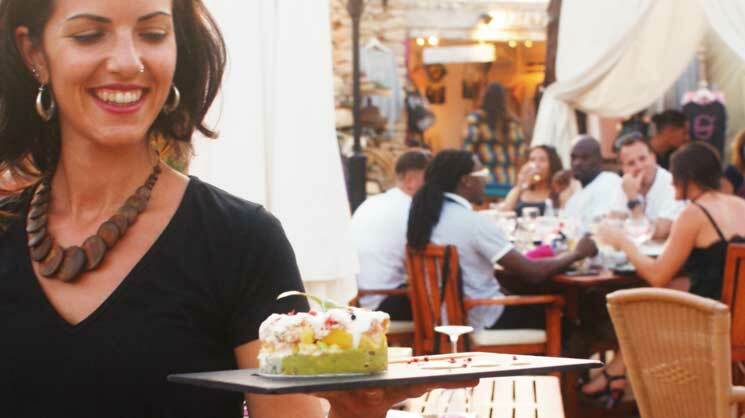 At Kumharas, it is simply you, the view, and great entertainment with a drink in your hand. 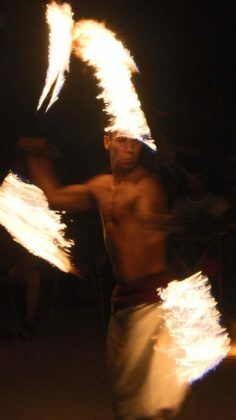 The fire show takes place after the sun has set and night fallen. On the sandy area in front of the beach these three combine acrobatics with ancient fire dancing rituals. 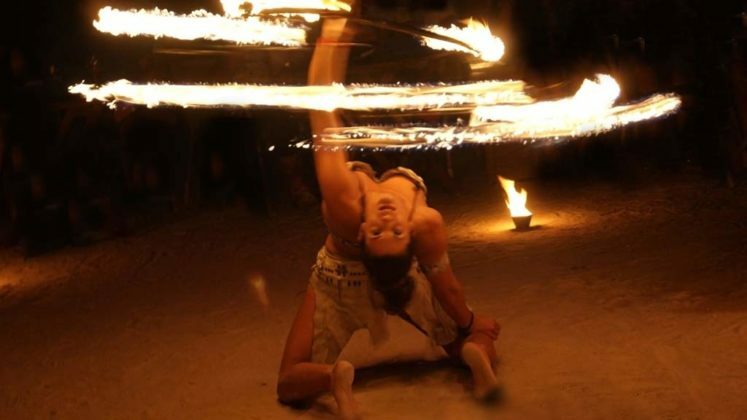 From swallowing fire through to spinning a hula hoop of flames, they are nothing short of spectacular. 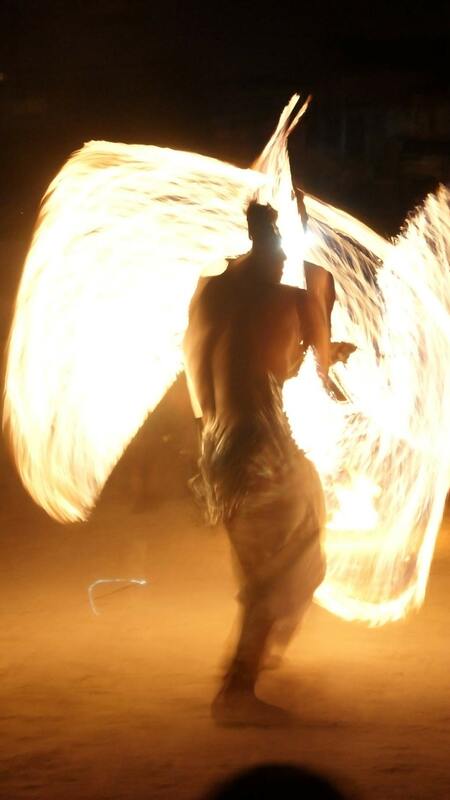 See our photo galleries of the Ancient Fire Spirit .